Expedition 55 flight engineer Drew Feustel is seen working outside the International Space Station on the 100th spacewalk conducted by expedition crew members. Two U.S. astronauts worked outside of the International Space Station Thursday on what marked the 100th spacewalk performed by crew members living on board the orbiting laboratory. Expedition 55 crewmates Drew Feustel and Ricky Arnold, both of NASA, spent six hours and 10 minutes conducting maintenance activities on the exterior of the space station. At the start of their outing, after exiting the Quest airlock, Feustel and Arnold went separate ways to accomplish two different tasks. Arnold worked his way over to the port side of the space station's backbone truss and mounted himself on a platform on the end of the Canadarm2 robotic arm. After taking a short ride on the end of the arm, which was controlled from within the space station by NASA astronaut Scott Tingle, Arnold set about disconnecting and retrieving two jumper cables from near one of the orbiting complex's radiator panels. The pair of hoses, which were isolated on an earlier spacewalk, are suspected of being the source of a small ammonia coolant leak and will be returned to Earth for analysis and repair. Expedition 55 flight engineer Ricky Arnold riding on the end of the Canadarm2 robotic arm outside of the space station. Meanwhile, Feustel made his way over to the end cone of the Tranquility node, where he installed two handrails, each with integrated Wi-Fi-like antennas. The new hardware will route data from an upcoming experiment that will measure the temperature of plants on Earth to better understand the amount of water they require and their response to stress. The radiometer, named ECOSTRESS, will be launched on a SpaceX Dragon spacecraft and added to the platform on the outside of the Japanese Kibo module later this year. Next Feustel repositioned a different jumper cable from the starboard truss to the side of the Destiny laboratory, where it will be needed for the next spacewalk slated for May. Feustel then reunited with Arnold along the port side truss to replace a standard definition (SD) video camera that no longer was able to pan and tilt as needed. The SD camera, which sits between a light and a high-definition camera, is used by the crew to monitor visiting vehicles as they come and go, as well as other activities outside of the station. Expedition 55 flight engineer Drew Feustel is seen near the Cupola outside the International Space Station on March 29, 2018. Finally, Feustel completed a "get ahead" task, breaking the torque on bolts securing a coolant system pump module in preparation for its move on the next EVA. With that complete, the spacewalkers returned inside the Quest airlock and switched their suits off of internal battery power, officially marking the end of the EVA. 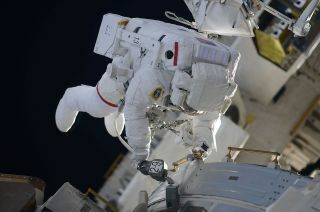 Thursday's spacewalk marked the first major activity since Feustel and Arnold arrived at the station just six days ago. The two astronauts, along with cosmonaut Oleg Artemyev, docked their Soyuz MS-08 spacecraft at the orbiting lab on Friday (March 23), two days after launching from Russia's Baikonur Cosmodrome in Kazakhstan. This was Feustel's seventh spacewalk, after three working on the Hubble Space Telescope in 2009 and three outside the space station in 2011 during the penultimate mission of the space shuttle program. He now has spent a total of 48 hours and 28 minutes working in the vacuum of space. Arnold has now performed three spacewalks, including two at the space station in 2009. His tally is now 18 hours and 44 minutes on EVA. Station crew members have now made 100 spacewalks in the complex's 17 years of continuous human occupancy. The first such EVA was made by Expedition 2 crewmates Yuri Usachev of Russia and James Voss of NASA to install a docking cone on the Zarya module. That spacewalk, on June 8, 2001, lasted just 19 minutes. Of the 100 spacewalks, 51 were conducted using Russian Orlan spacesuits. The remaining 49 used U.S. EMU suits, like those worn on Thursday's excursion. When also including the EVAs made by space shuttle crew members, Feustel and Arnold's spacewalk was the 209th in support of the space station assembly and maintenance since December 1988.